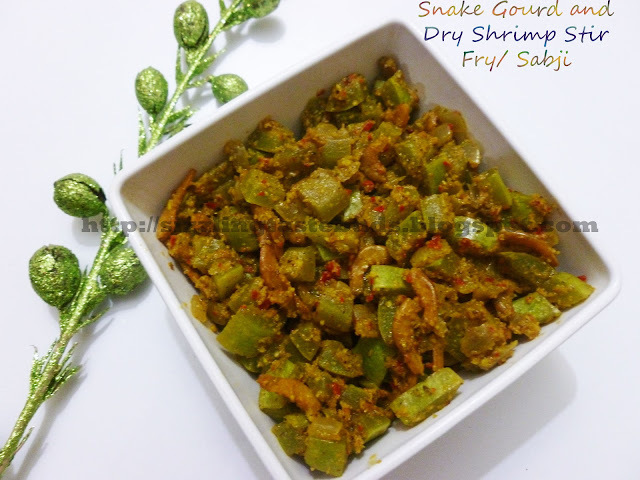 I have already posted simple Snake Gourd Sabji ( Veg) in my blog. 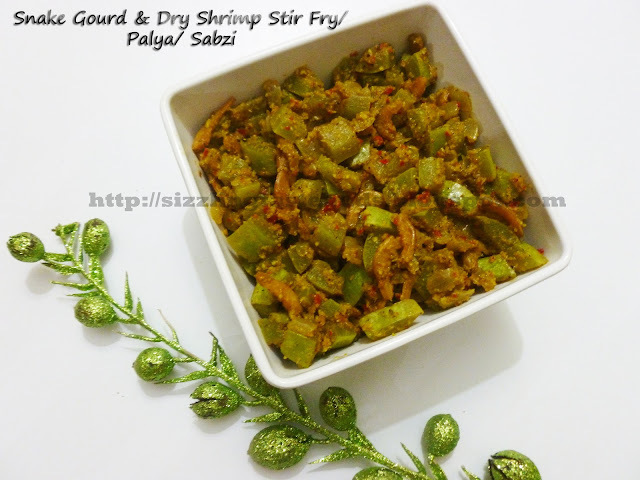 Today's special is Snake Gourd and Dry Shrimp( Prawns) Stir Fry or Palya or Sabzi, call it by any name. This might seem weird for some but for the konkan coastal area people, its a very common dish. We like this sabzi more than the normal sabzi which I have already posted. For Vegetarians, you can try this without adding shrimps or can try the simple pure veggy version sabji. ( Click here for the recipe). 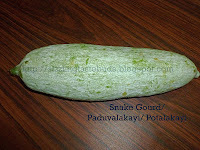 Snake Gourd is also known as Padavalakayi or Potlakayi in Kannada. 1. Wash the Snake Gourd and remove the seeds from inside. Chop it into small cubes and discard the seeds. 2. Coarse grind freshly grated coconut and red chillies. 3. Clean the dry shrimp (removing the head part and tail ). Wash it and keep aside. 3. Take a kadai, add chopped onions, Chopped Snake Gourd pieces and dry prawns(shrimps) with liitle water and cook it by covering it with a lid till the vegetables are half cooked. 4. Add Haldi, Dhania powder, coconut paste and Salt to taste. Mix well and cook it till vegetable is cooked and all the water evaporates. 5. Enjoy it with a simple lunch/ dinner with dal, rasam and rice.